We motivate and inspire our students Pform.nz from a young age which helps them develop skill sets that they will find useful in later life. 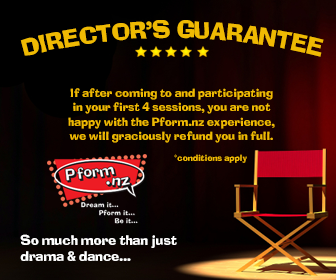 Pform.nz offers a range of classes to children and teens of all ages. We offer dance, drama and performing arts classes in Kohimaramara to children and teens aged 10 years to 18. We hold all of our junior Kohimaramara classes Kohimaramara Primary School and our older classes at the ASB Stadium. Our tutors Gracie and Sammie are on hand every Monday during term time teaching a DANCE | SING | ACT class for 10-13 year olds. You can find her in the ASB Stadium, head down to the back carpark and head through the large double doors into the studio for class. Directions: The studio is situated around back on the right hand side (looking at the building) of the ASB stadium. Go down past the Basket Ball/Tennis courts to the stadium then down the driveway on the right to the back car park. Our room is behind the glass doors that open out to the back carpark. Kohimarama - the old ASB Stadium.